Most people who are buying a budget class computer system probably aren't going to be getting into their computer to upgrade it. Because of this, smaller desktops make sense as long as they don't sacrifice the features and performance of a traditional desktop. This is precisely what makes the Dell Inspiron 3000 Small so appealing. The system offers more performance, storage, and features than other systems at this price point, including some full-size systems. So, as long as you don't need to add more internal drives or a high-end graphics card, this system is probably one of the best options on the market. Slim design restricts upgrade options compared to full-size desktop PCs. Intel Core i3-4150 Dual-Core Desktop Processor. 1TB 7200rpm SATA Hard Drive. Intel HD Graphics 4400 Integrated Graphics. Gigabit Ethernet, 802.11b/g/n Wireless, Bluetooth. Two USB 3.0, Four USB 2.0, HDMI, VGA, 8-in-1 Card Reader. 10.5" x 4" x 15". Dell's small form factor Inspiron desktop has looked pretty much the same for the past couple of years. While it used to be available in multiple colors, there is just the traditional black color these days. Even though the exterior may be pretty much the same, the interior components have changed much over the years and they have also changed the name to the Inspiron 3000 Small compared to just appended an "s" on the end of the model number as in past versions. 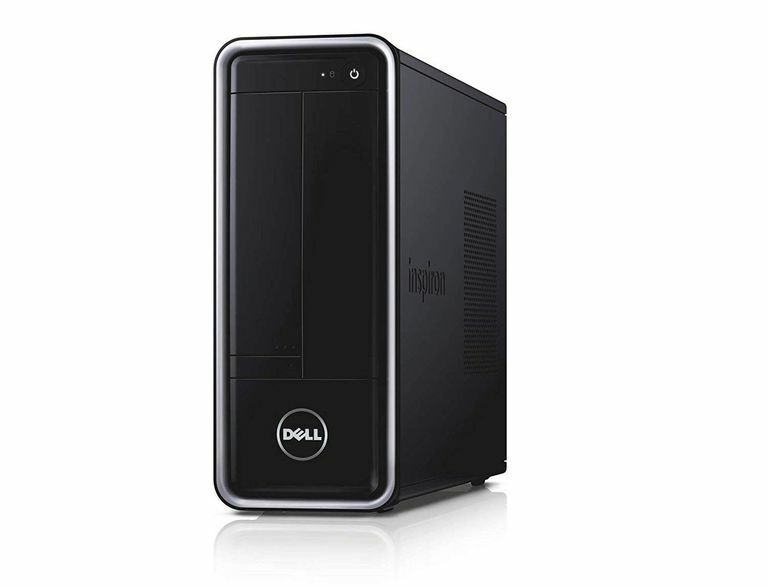 Powering the Dell Inspiron 3000 Small is the Intel Core i3-4150 dual core processor. This is a relatively new low-end Core i3 desktop class processor but it provides some solid performance thanks to the 3.5GHz clock speed and support for Hyperthreading. It should provide more than enough performance for the basic computing tasks and is capable of graphics and video work if needed, just not as quickly as the quad-core Core i5 processors found in more expensive systems. The only thing holding back the performance is the fact that it uses just 4GB of DDR3 memory. This is fine for basic tasks but even with Windows 8's improved memory management, it will slow down under heavy multitasking or more demanding applications. The system memory can be upgraded to 8GB with relative ease as the system has two memory slots but only a single 4GB module installed. Most of the desktops priced under $400 tend to have just 500GB for their storage. Dell has managed to include a full terabyte size hard drive that offers twice the storage of many systems at this price point. This provides it with a bit more performance and more importantly space for applications, data and media files. If you need additional space, there is not really any room inside of the slim case design to fit additional drives but Dell does include two USB 3.0 ports on the rear of the system for use with high-speed external storage drives. The system does continue to use a full-size desktop class DVD burner that allows for playback and recording of CD and DVD media and at faster speeds than compact systems that rely on laptop sized drives. The graphics for the Dell Inspiron 3000 Small is a bit better than most as it uses the Intel HD Graphics 4400 built into the Core i3 processor. This is still not a powerful solution for 3D graphics but it can be used for some games at lower resolution and details levels if it is needed. It does offer some nice acceleration of media encoding and decoding when used with Quick Sync Video compatible applications as well. If you want to upgrade the graphics, there is a PCI-Express x16 graphics card slot within the system that can be used to add a graphics card. Mind you, there is limited space within the case from the shroud for the CPU cooler and other components that will restrict what cards will fit in it. In addition, the power supply is just 220 watts which means that it the card must not require any external power. The best would be some of the NVIDIA GeForce GTX 750 cards that use a slimmer single slot profile. Another benefit of the Dell Inspiron 3000 is the inclusion of Wi-Fi networking. Most homes now feature some sort of Wi-Fi networking to support the various mobile devices in their house. Including the feature for desktops is becoming a bit more common as it makes it easier to place the system anywhere in a house without needing a wired connection to the broadband router. It still is not a very common feature at such a low price point. There is a less expensive version available that switch out the larger hard drive for a 500GB model than the model that we tested, which removes the wireless networking and use a Pentium G3220 instead of the Core i3 processor. There are two primary competitors to the Dell. If you are looking at a slim or compact desktop, then the Acer Aspire AXC-603 which is actually much more affordable but it sacrifices a lot of performance and ​upgrade potential. If size is not an issue, then the HP 110 desktops are available with a previous generation of Core i3 processor for similar performance at roughly the same price point.